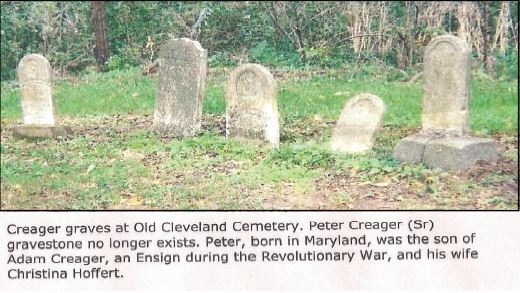 Peter Creager was the son of Adam and Christina (Hoffert) Creager. Adam was a Revolutionary War veteran. Peter Creager settled in what is now Whitley Co., IN in 1836. He migrated from Maryland in 1812 with his first wife, Eve Ahlbach, to Montgomery Co., OH. Eve died there in 1812. He left for Indiana with his second wife, Elizabeth Rike/Reich in 1835. The family burial site is at the Cleveland Family/Old Cleveland Cemetery in Whitley Co., Indiana. While Peter’s stone has been lost, the graves of several of Peter’s immediate family can be seen there. This entry was posted in Whitley County and tagged Ahlbach, Albach, Creager, Hoffert, Hufford, Kruger, Mettert, Obenchein, Reich, Rike, Williamson on July 16, 2014 by oahblog.